Walls, ceilings, floors, buildings all display the art of mosaic throughout history. Much still survives after wars, natural disasters, vandalism and time. 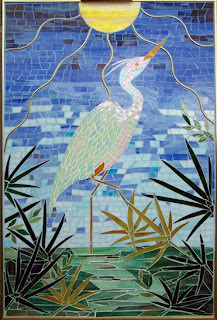 Many of St. Augustine’s historic buildings harbor fine examples of mosaic. As a student at Flagler College in the 70’s, I never tired of studying the mosaic floor of what originally was the lobby of the Ponce De Leon Hotel built by Henry Flagler in the late 19th century. I still have two small unused tiles, a souvenir of the extraordinary work that went into the hotel. My interest now is with stained glass mosaics. All of the stained glass is hand cut by me and then set into place with a very strong glue. Embellishments are added for texture and interest. Along with shells, beads, mirror, vitreous glass pieces, I have used brass rods, wire, crystals and rhinestones. I enjoy searching my cabinets and drawers of art and craft supplies to come up with just the right addition to the glass design as well as using polymer clay in several of the pieces to add dimension. I first look at something for what it is, and then look at it for what it could be. Finding solutions to my design dilemmas is great fun! I then use sanded grout and most of the pieces contain two or more colors of grout. Some pieces use masonite as a support and are not recommended for extreme outdoor use. Plexiglas, Wonderboard and Hardiboard are suitable for exterior use and the metal frames on each are primarily added for a “finishing touch”. I am a self taught artist and have been drawing, painting and creating forever. After several careers which were not art related, I found myself working in an independent art supply store. It was the proverbial “candy store” for me. Inspiration was unavoidable being exposed to the local art community and their work. Having all the newest products and supplies at hand spurred me to delve into different mediums until I discovered mosaic. I love the idea of creating art out of various materials, making it all come together from bits and pieces. Each piece is a new challenge. For the past two years, I have been learning, creating, selling and exhibiting my work in Northeast Florida. Each piece is original and all glass is hand cut by me. I like to embellish with clay, beads, mirror, shells and other found objects. My designs are rooted in what I see around me. The ocean, marshes, lakes and backyard wildlife afford me endless subjects! Along with creating my own ideas, I am happy to accept commissions.